The rare August cool fronts which have stalled over Central Texas in the past week or so have brought welcomed rain to the hot August days…and nights, (with apologies to 1972 Neil Diamond). Between the drips, drops, and gushes of rain, coupled with sparkles of Texas sun which has filtered through from time-to-time, foliage in my Austin, Texas garden is washed clean of summer’s dust and birds’ poop. 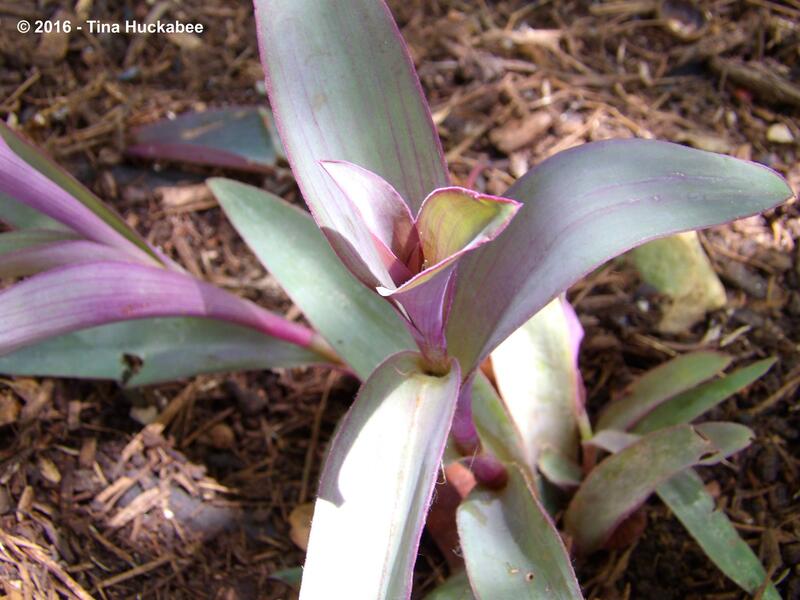 Purple heart plant, Setcreasea pallida, is a native to Mexico, but a naturalized plant throughout much of the southern United States. 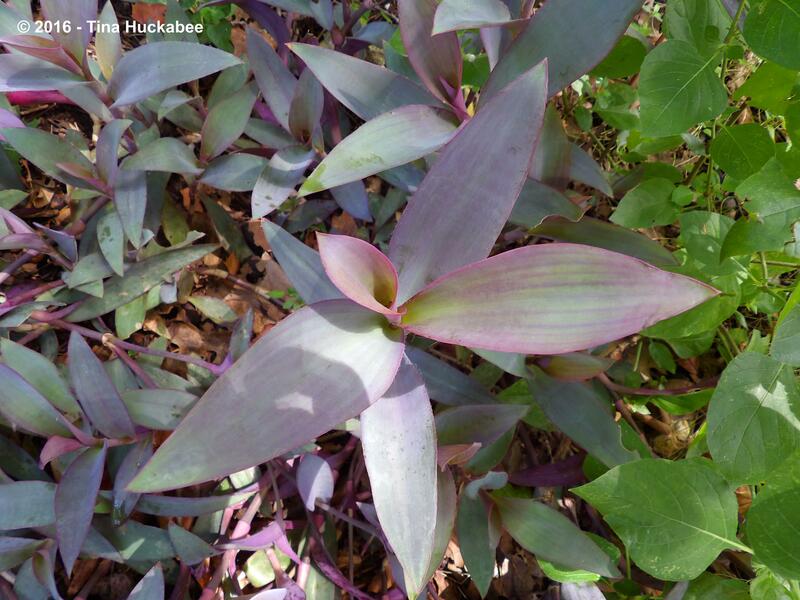 The foliage is of this shade and sun groundcover is purple, but other subtle coloring imbues the plant with opalescence. It’s a great ground cover for this area, one that withstands the capriciousness of our climate–drought, heat, flood, and freeze. Once established, it spreads with glee and requires reining in on a seasonal basis. It seeds out sometimes, like in this container of Texas beargrass, Nolina texana. I’m pleased that the Purple heart chose a purple pot to settle in. Purple heart is one of the few non-spiky, non-green, hardy perennial choices available for this region and adds purple pizzazz to any garden. Tasmanian Flax Lily ‘Variegata’, or Dianella, Dianella tasmanica ‘Variegata’ is another non-native plant flourishing in my garden. 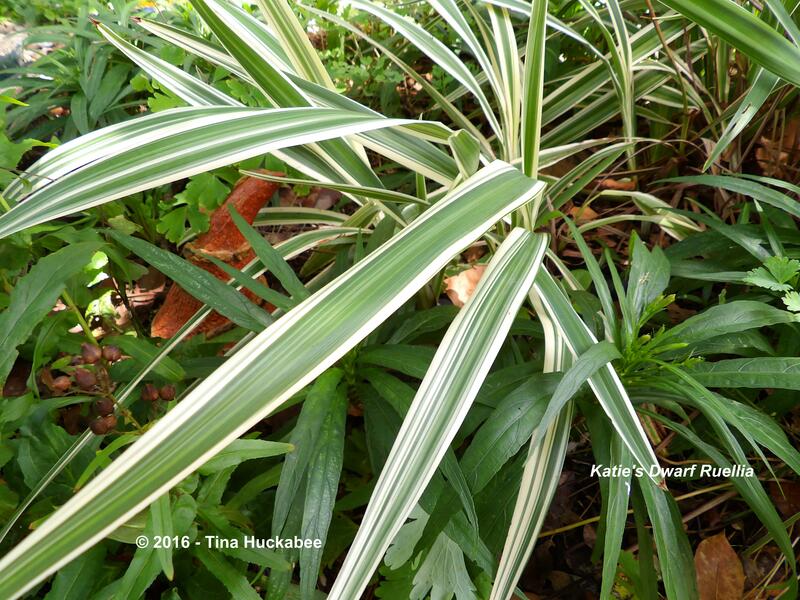 Dianella’s snazzy green and white foliage stripes cheer several spots in my garden and bring needed structure to predominately shrubby plant combinations. I usually plant three or four together for a dramatic effect. Dianella is water-wise and low-maintenance during our hot summers, though it needs covering during winter freezes. I find this plant well-worth winter babying because it’s light and bright and complements other plants. 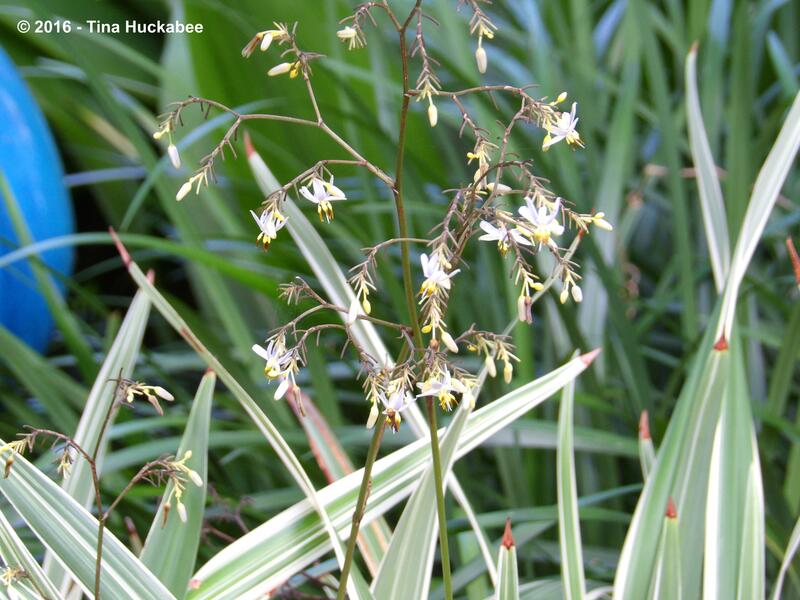 Dianella also produces flower stalks with tiny blooms atop, though most gardeners plant it for its foliage. My honeybees visit the dainty blooms and I’ve also seen small native bees show an interest. 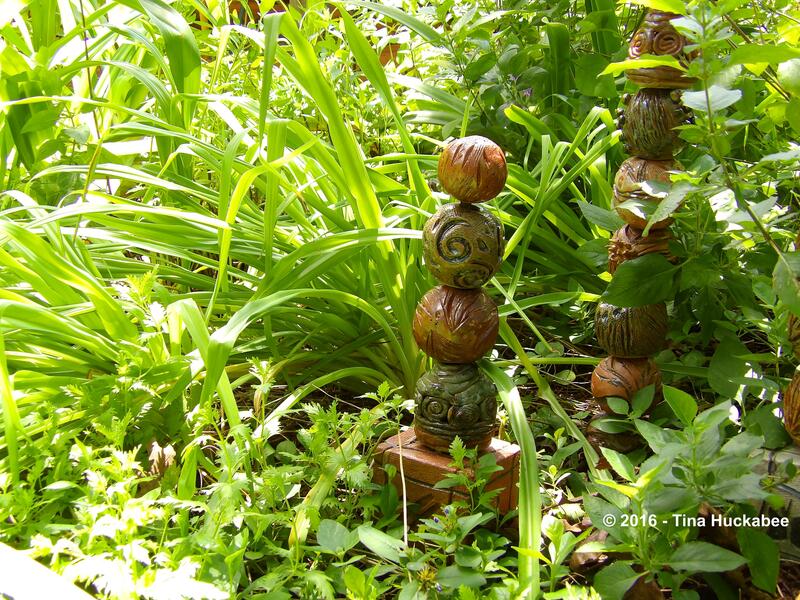 It’s a win-win for critters and gardeners alike. 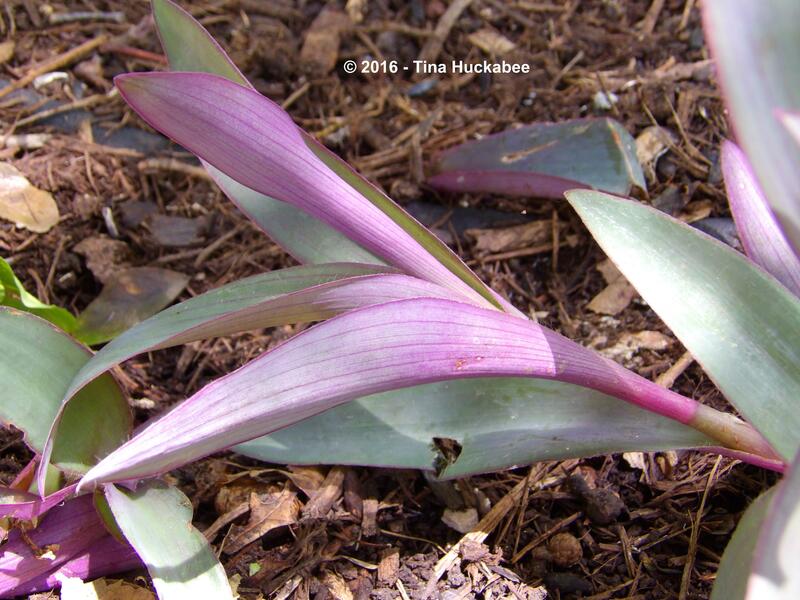 A native member of the Liliaceae family, Texas Craglily, Echeandia texensis, is about to begin its blooming cycle, but the foliage is lush from late spring until frost. I’ve planted a number of these over the years and enjoy their contribution to my garden. One group of Texas craglily is situated with the also fall-blooming Gregg’s mistflower, Conoclinium greggii, whose foliage inspires common names such as Palm-leaf mistflower and Palm-leaf thoroughwort because of the palmate shaped leaves. 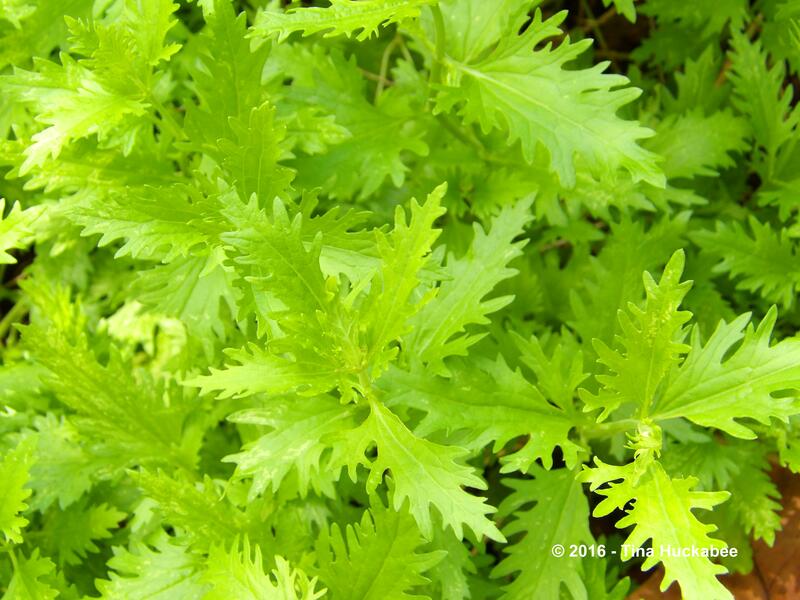 Deeply lobed and vivid green, Gregg’s mistflower foliage is attractive for the whole growing season. Pink-n-green-n-white is always a winning color combo, but especially so in this recent impulse-purchased and potted Sedum spurium ‘Tricolor’. I’m hoping for a glorious draping here and to not over-water the pot. 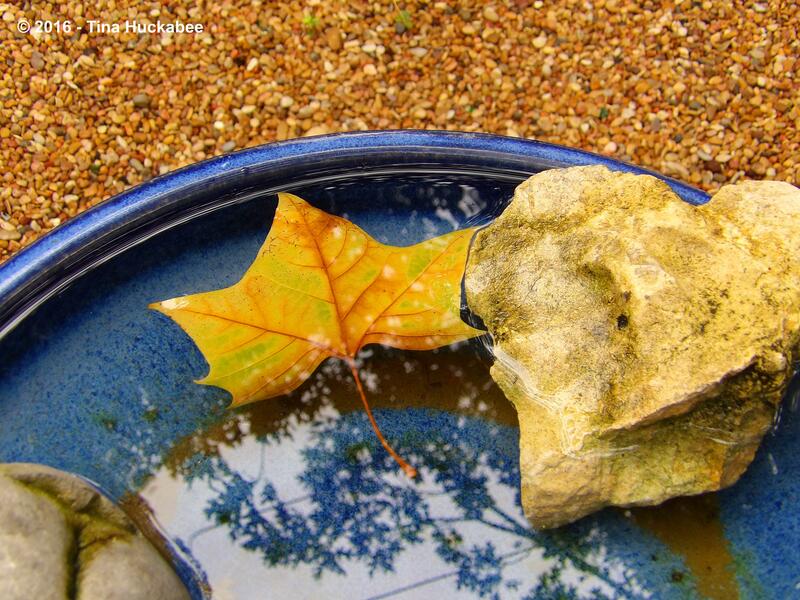 Finally, a capture of the harbinger of November’s autumn leaf change floating in a bird and bee bath. In November, foliage change in my garden will be about the less direct sunlight and cool temperatures. But this American sycamore, Platanus occidentalis leaf is probably a victim of the pre-rain Texas summer sun and heat. 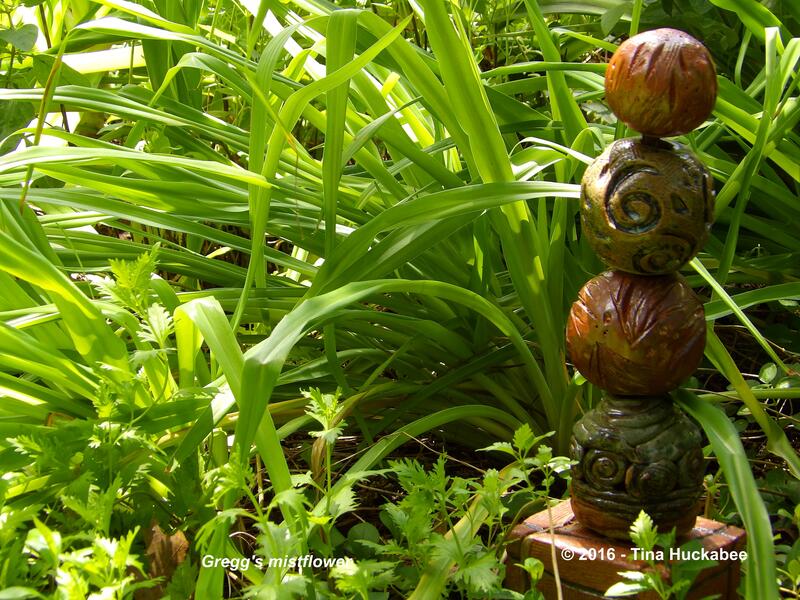 Thanking Christina and her lovely Creating my own garden of the Hesperides for hosting, check out her Garden Bloggers’ Foliage Day post for a look at foliage in many gardens , from many places, and then share your leafy loveliness. 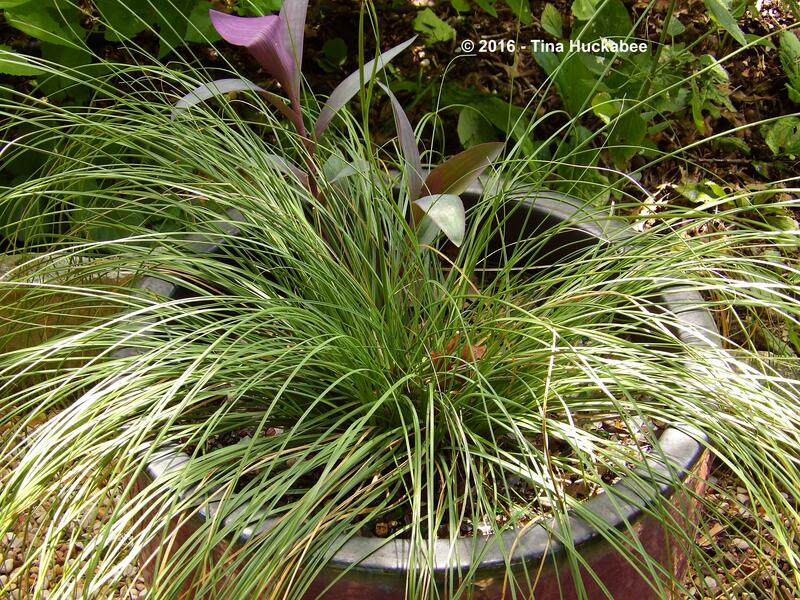 This entry was posted in Dianella, Gregg's Mistflower, Purple Heart, Tasmanian Flax Lily, Texas Craglily, Uncategorized and tagged Garden Bloggers' Foliage Day, GBFD by Tina. Bookmark the permalink. Those plants all work so well and are so easy. Whole beds of purple heart are turning up in public gardens and commercial landscapes more and more. Christy Ten Eyck used it extensively in a new installation in San Antonio last year. I’ve been encouraging mine to fill in more areas. My variegated flax lily is new this year so glad to know that I can cover it to get it through the winter. I’ve always been fond of the Purple heart, though I’m aware that it’s become ubiquitous, especially in southern Texas. I’ve had areas that I’ve removed it and then added it other areas, but I’m always happy with its performance, I hope you’re as happy with the flax lily as I’ve been–it’s a favorite plant of mine. I love the foliage of your Setcreasea pallida, I would try some here if I could find some. All your chosen foliage looks really fresh and not parched as i would have imagined a Texan garden to be. What is your soil type? Mine is free draining tuff, which doesn’t do any favours to the plants when it is very hot. 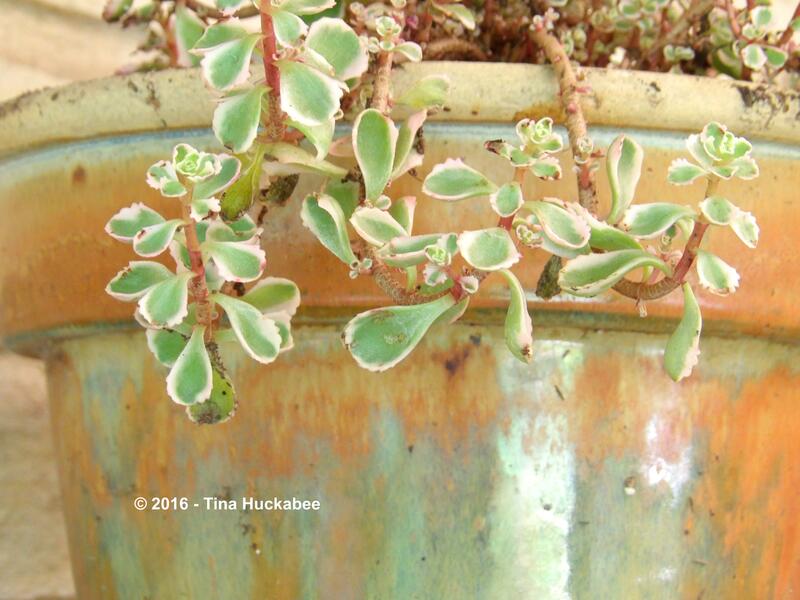 I had that Sedum, but it disappeared in the prolonged drought last year and didn’t return. Thanks for joining GBFD this month, a very useful contribution. Oh, I wish I could mail you some Setcreasea! It would probably do well. Interestingly, I met a German woman yesterday visiting a neighbor and she said that she’s seen it growing in pots in Darmstadt. The lack of “parch” is our rains over the last 10 days; normally, August is dry and very hot. My particular soil is heavy and clayey, but just a few miles to my west, the soil is thin and rocky. I’m glad to have joined in–thanks for hosting. Yes, I’d agree with that, I don’t augment my soil, preferring to plant what works without, well, much work. 🙂 If I really want something and I know it’s not going to be happy in the heavier soil, I’ll put it in a pot. I’m starting to do that with plants that need watering but that I really want. Everyone seems to have Neil Diamond on their minds today. Currently listening to Hot August Night. Ha! I don’t normally think about Neil Diamond, but, Hot August Night. Yeah. Tina me encantan todas sus plantas y me alegro de que haya llovido y refrescado. Yo tengo 4 tiestos grandes de Corazón Púrpura y es una planta preciosa. No la puedo plantar en el suelo porque en invierno nieva y se congela. 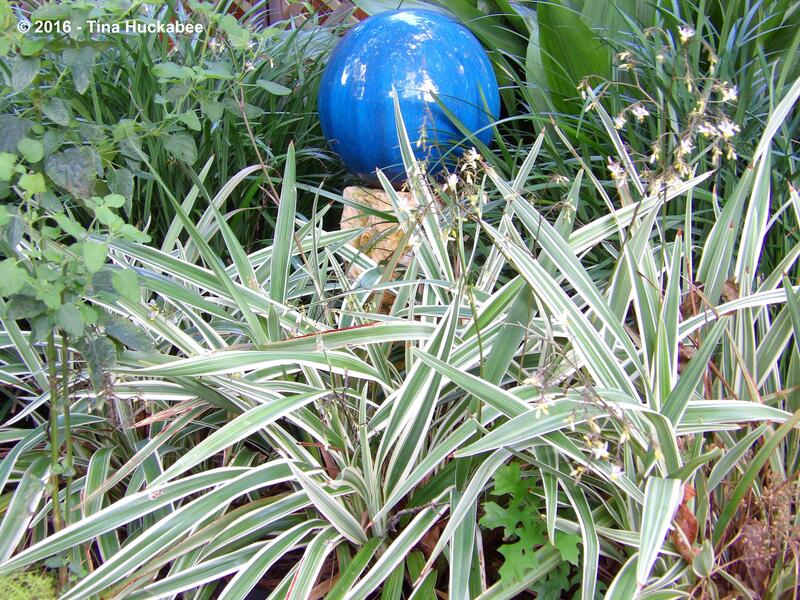 Me ha gustado mucho su planta Dianella tasmanica ” Variegata ” : tiene unas hojas maravillosas. Saludos de Margarita. Thanks, Margarita. The Purple Heart will freeze to the ground, but returns from the roots. Isn’t the flax lily a pretty thing? Sí Tina, el Lino lirio es divino. Muchas gracias por decirme que aunque el Corazón púrpura se congele, vuelve a salir de sus raíces. Voy a plantar en el suelo el tiesto más pequeño. Saludos de Margarita. Wishing you good luck with the purple heart in a pot, Margarita..
New plants for me and more beautiful foliage! Tina, it’s nice to see you’ve featured Purple heart today. A coworker passed some along to me a dozen years ago or more and it never fails to make me smile when I see it return. I’m glad you’ve enjoyed it so much. I find it a valuable perennial–pretty, tough, a good pollinator plant–win, win, win! The Dianella is a really charming plant! 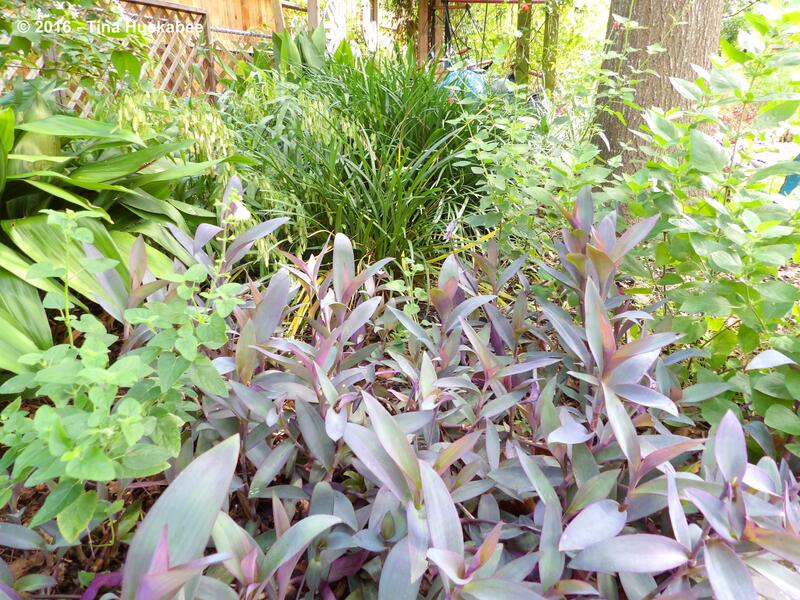 I love that you included Purple Heart plant in a blog….it is nearly a weed here but i like them! I have trouble finding them to buy actually. They are perfect for people that aren’t gardeners and want low maintenance : ) Our few Dianella are not enjoying the torrential down pours we are having here in Houston. I hope they come back. Your plants look very lush! Happy Gardening! I think lots of folks consider it a weed, but to me, a trouble-free, attractive, xeric an hardy plant which feeds wildlife–it’s a super winner! Beautiful words and images, Tina. I am a big fan of purple heart, too. That last photo is amazing. It’s a great plant!! And thanks!